Fashion is one of the most prominent industries on the planet. Unfortunately, it also is one of the biggest polluters. Environment aside, though, fashion has evolved like no other sector—from the ancient days in Europe when both women and men wore “hideous” garments and called it fashion to the present day when clothing seems to have fewer seams or fabric. Along the way, designers—especially prominent design houses—have come up with questionable items that have sold for thousands of dollars. Of course, if you can afford it, then you definitely see something that most of us don’t. Below is a list of questionable items produced by fashion designers that still leaves us with visible question marks above our heads. This shoe came out during the Plato Atlantis Spring/Summer collection in 2010 and is also referred to as the “armadillo boot.” It was said to give the illusion of a ballerina on her tiptoes. The shoe is 30 centimeters (12 in) in height and originally wasn’t meant to be commercially produced. However, loyal fans were eager to buy this shoe. 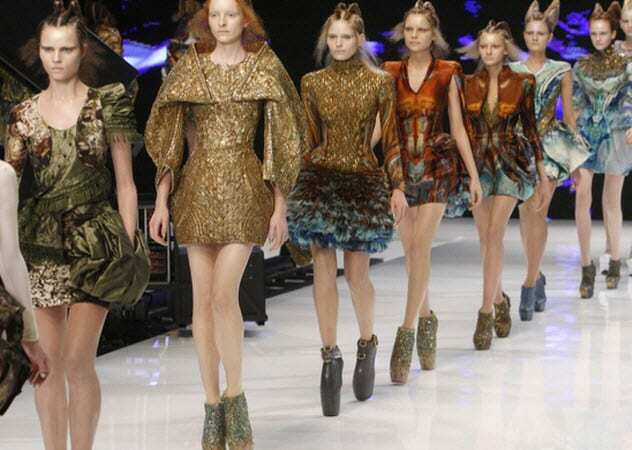 No lie, Alexander McQueen’s design style is bizarre and that is what makes it high fashion as well as art. This shoe looks like art, and we would have no objection to ogling it outside an alarmed glass box in a museum. The original shoe is said to be made of wood, but the ones commercially produced were made of python leather. Despite the shoe’s menacing design, it didn’t stop the women who decided to be daring and pursue the taste of a 30-centimeter (12 in) shoe. Just the look of it makes you imagine a billion ways to fall and land on your face. For example, Daphne Guinness, a fashion icon known for wearing the most daring pieces, fell into a sea of her fans by the cobblestones at a churchyard. Surprisingly, Lady Gaga snatched three pairs of these shoes and was seen on her Instagram daring to wear them. They originally had a guide price of $10,000, but Lady Gaga bid up to $295,000 to win the auction for all three pairs. What women really do for a pair of shoes! Jeremy Scott debuted this dress in the Moschino Fall/Winter 2017 runway collection. It is a slip-on, sleeveless dress made of polyester with writing at the top and bottom. We don’t know what kind of look the brand’s creative director was trying for or who accepted this dress to go on the runway the way it did. Stella Maxwell, the runway model rocking this look, was put into a black dress and had the bag—oh sorry, dress—slipped on top of it. To seal this customer-friendly dry cleaner’s look, they put a hanger in her hair. Many critics described this new fashion statement as a dry cleaning bag—you know, the one that you put over your clothes after they’ve been dry-cleaned. The most interesting part is that it sold for $735. Who bought it is still a mystery. Now we have all seen our fair share of interesting accessories—from plate clutches to hangers in the hair. 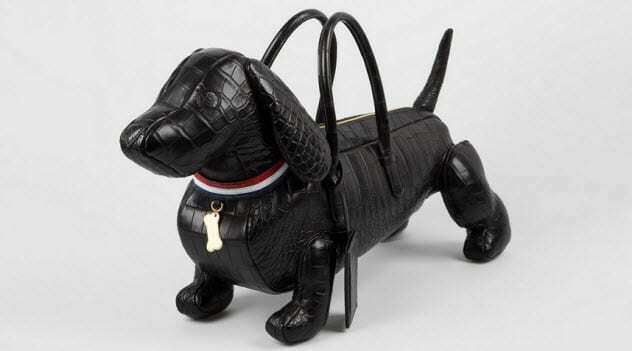 Thom Browne decided to come up with a dog bag, and it does look like an adorable little pooch. It is made from luxurious leather and has a little collar on it. And guess the surprising thing? It is still being sold for over $30,000. The famous dog bag was inspired by the designer’s dachshund, Hector, one of the best-known pets on Instagram. You can even see the shape of a dog imprinted on some of Browne’s designs, which shows how much he loves his pet pooch. Remember when we mentioned that current fashion has fewer seams and fabric? 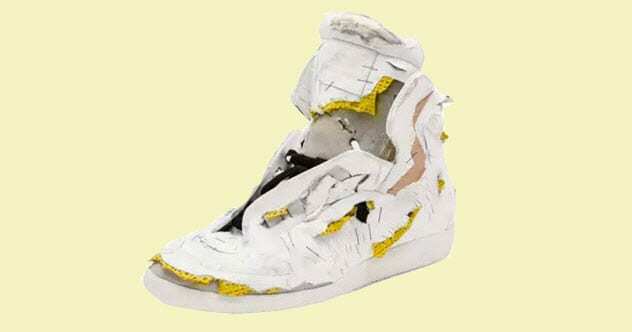 Well, Maison Margiela has joined the league with heavily distressed sneakers. So, if this is a trend, don’t you dare throw out the shabby sneakers you have worn for many years. The white-and-yellow high-tops are being sold for $1,425, which probably isn’t bad for a designer shoe. But it is a terrible price for a shoe that looks like it has been chewed up and worn by your ancestors. Western has been a popular trend in 2018, but we want to know if it was inspired by this. 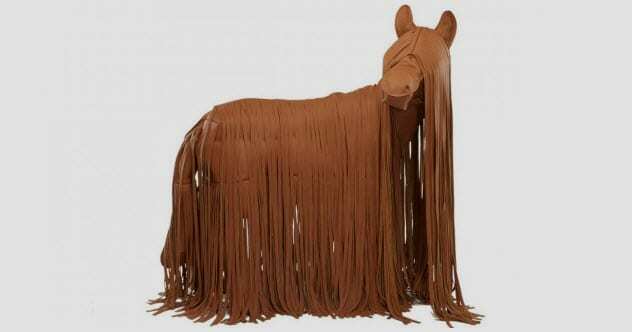 Hermes came out with this fringed brown horse statue that costs more than a Porsche. Ekta Joshi of Luxury Launches mentioned that “luxury” often means “absurdity,” and we agree. Hermes is a notable brand with one of the most expensive bags anyone can own. They all look the same, just with different materials and sizes. (Their micro purse is to die for.) Over the years, Hermes has made a name for itself as one of the top bag brands in the world. So, why would they create something as absurd as the Marley the Pony statue, which is priced at $133,000? The purpose of this piece of art is unclear. But from an outsider’s point of view, Marley is art in all its absurd glory. Ines Figaredo is known for her unique bag designs. However, we are sure that she put everyone in a horrific panic when she came out with this clutch made of human hair. Again, this hangs question marks above the head. The bag is just a normal clutch with human hair flowing down the front. Do you know what the scariest part is? Eyes are glued or sewn onto the bag behind the hair. 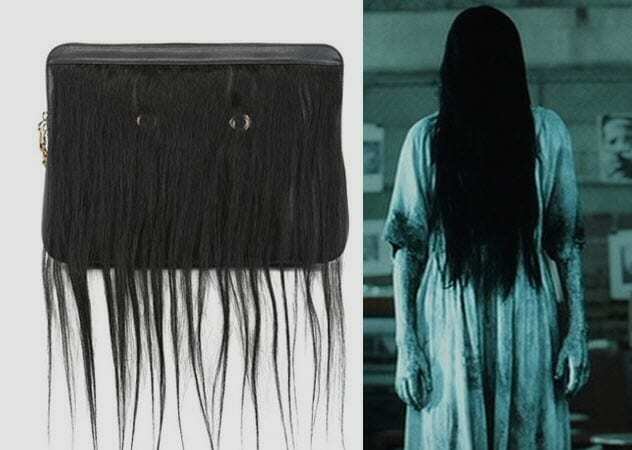 A blogger wrote that this bag reminded her of The Ring, a horror film with a character that has long black hair covering her face. If you haven’t watched The Ring but have seen The Grudge, then this Ring female character is similar in appearance to the Grudge female ghost in the house—sort of. If you want more of a scare, the clutch retails for $1,928. No need for a costume next Halloween, Ines has got you covered. Yves Saint Laurent took it several inches further with their goat hair ankle boots. As weird as they may look, they may have a few functions like keeping your feet warm in the winter. No need to stock up on stockings, eh? Well, this pair of shoes that makes one look like a descendant of Bigfoot retails at $1,995. The actual shape is a bit unseen. 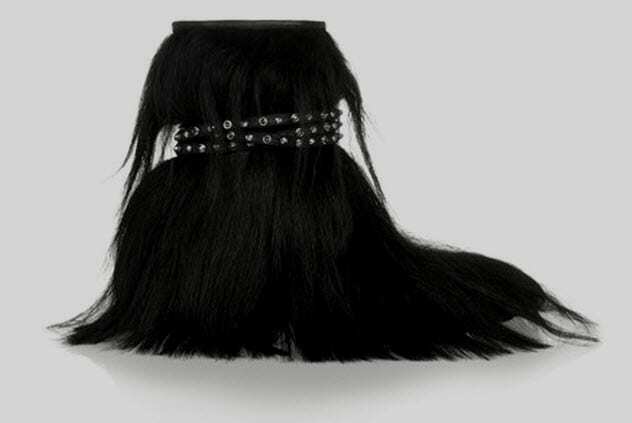 But from the little peeks in between the hairs, you can tell that it has a somewhat pointed toe and is black with silver studs at the ankle. It doesn’t look as bad as it sounds. We think it is quite playful. It would probably be one of those items that are cheap and just for laughs. It would also be a good souvenir, but Luisaviaroma sells it at $5,230. Jaw-dropping, yes. It makes you wonder if this LEGO beanie piece is actually made of a costly material we can’t see. In any case, why would anyone use expensive materials to create something that serves no purpose at all? We are stunned. This headpiece was carefully crafted from ostrich feathers and has a brooch at the center to hold them into place. If you’re having a bad hair day, this piece will fix you right up and give you a different kind of look at a price of almost $2,000. Again, we ask, “Why?” All we can envision is the designer using a woman’s bad hair day as her piece of art and as a moneymaker. 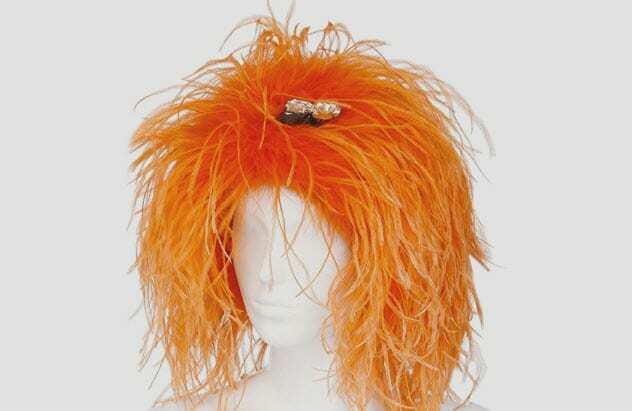 This headpiece comes in orange, yellow, and black. In 2017, Balenciaga came out with this ultraexpensive bag. As people who can’t afford to buy a bag from Balenciaga unless we saved up really hard for the entire year, you would say that we are haters and jealous. However, the only difference between the notable, cute bags that Balenciaga has sold and this one made people on the Internet laugh really hard. Yes, we’re talking about the IKEA-looking Balenciaga bag. 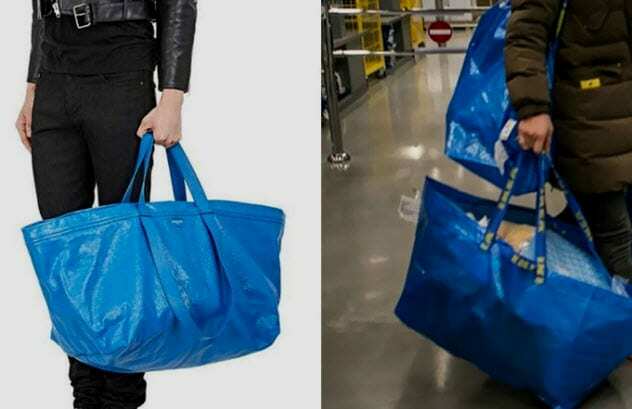 It looks almost exactly like the IKEA Frakta tote bag which goes for just $0.99. Meanwhile, Balenciaga sold theirs for more than $2,000. The only visible difference is that IKEA branded its version with its iconic yellow logo on the straps. In the design industry, fashion-inclusive “inspiration” can be drawn from anywhere as seen when a high fashion design house decided to almost reincarnate the IKEA bag with leather and a higher price. I am a university student doing design. However, I have worked as a writer, volunteered as an editor and proofreader of anonymous articles, and interned as a blog writer. For more fascinating stories about the history of fashion, check out 10 Modern Fashion Trends And Their Fascinating Histories and 10 Fascinating Ways The Nazis Influenced Fashion.